Fifteen years after murdering his sister, Michael Myers returns home to kill. After re-watching this movie last month I found myself posing bundles of questions. I know, usually people watch horror movies for the suspense, fright, and slashing. But The original HALLOWEEN seemed strangely thoughtful, as if there were many details that were left undisclosed. 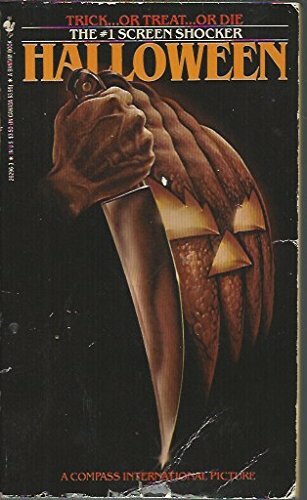 While I was doing research on the sequel that came out last month I discovered that there had been a novelization of the original film that got very good reviews and people felt it gave new meaning to the story. I happen to love reading movie novelizations so I tracked down a copy, which isn't very easy depending upon which format you prefer. Everything you see in the movie is contained within this tome, however, all the background, details, and introspection that I hoped for are all included. You find out what motivates Michael Myers to become a serial killer. You find out what goes through his mind. You find out links to the past. The book isn't very long but rewards the fan with a plethora of details that were omitted from the big screen. If you are a fan of the series, horror, or are just curious, I would call this book very worthwhile to read, as well as rewarding.